My husband told me I should get a picture of the Galaxy Diner sign downtown, before it disappears...only, it was a "Shorty's Diner" sign. 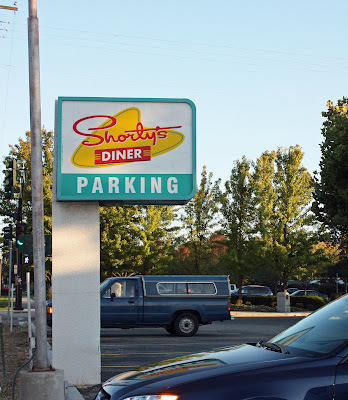 I think "Shorty's" was a short-lived project after the Galaxy closed. The Galaxy used to be JB's Big Boy - if you remember those days in Boise. In fact, JB's owned the Galaxy. The sign is all that's left. The restaurant was torn down and the land is being used as parking, and is "for sale." I have given your blog an award for wonderful fall/autumn photos. Stop by my blog on today's post to pick up your award and then pass on to others. The same thing happened to my favorite diner in Tulsa. It was called the Metro and had all kinds of 50's memorabilia. Sadly, I don't have any pictures of it. I remember Big Boy's, but my eating choices have changed since I ate there as a kid/teenager. Good memories though.